Amber Alert for missing Houston girl, 6 | NOT IN MY WORLD!!!! 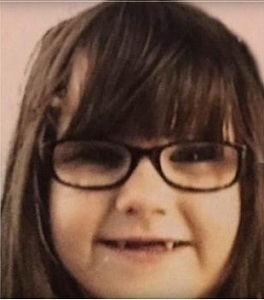 HOUSTON –Authorities have issued an Amber Alert for missing Texas girl Alexis “Lexi” Lynn Johnson, 6, believed to be with her mother’s ex-boyfriend. Police say the man, Harvey Eugene York Jr., was visiting the girl’s mother at her downtown Houston home around 5 p.m. Sunday when the two got in an argument and he was asked to leave, reports CBS affiliate KHOU. York was reportedly seen driving off with the child in the car. He is not the child’s father, reports the station. York is reportedly from Louisiana and was believed to be driving there. The child’s mother told KPRC that York’s mother called her Monday morning to report that he had stopped by her home in Zwolle, in western Louisiana, with the child. York was believed to be driving a blue 2000 Ford F-150 pickup truck with Louisiana license plate F163202. The truck was found abandoned Monday off a highway between Belmont and Zwolle, but there was still no sign of the girl or the suspect, according to CBS affiliate KSLA. Alexis Lynn Johnson is described as a white female, with shoulder length brown hair and blue eyes. She weighs about 63 pounds and is 3 feet, 7 inches tall. She is said to be wearing glasses. Anyone with information is urged to call the Harris County Sheriff’s Office at 713-221-6000.